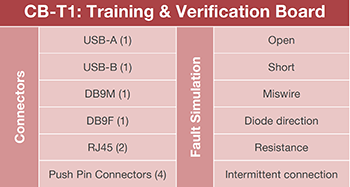 CAMI Research Inc. (Acton, MA) announces a new, dual-purpose connector board for training new users on its CableEye cable and harness testing systems, and for performing tester system verification. Demonstrated at the 2015 Wire Processing Technology Expo, the CB-T1 is a great way to familiarize new employees with CableEye test systems during their orientation. Training may be self-directed with this tool. Customers may also use the board for demonstrating CableEye functionality to their own customers as a way of creating a quick impression on production quality either during an audit, or during contract negotiations. Rated to 250Vdc/200Vac, the CB-T1 may be used on all CableEye Testers. 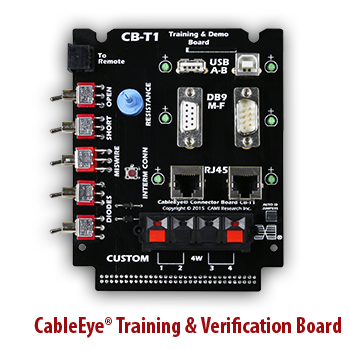 The CB-T1 is available as a SINGLE board for $195 (Item 800), and includes cable and instructions.